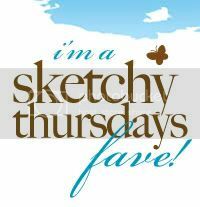 This week at http://letsscrap.ning.com/ I'm sponsoring the giveaway for the Card Sketch Challenge and it includes some awesome product from Stampin' Up so make sure you go and check out the challenge! Supplies: All are Stampin' Up unless noted: Cardstock - Brand New Crushed Curry, Melon Mambo & Bermuda Bay; Patterned Paper - Brand New Razzleberry Lemonade Designer Series Paper; Ribbon - Brand New Crushed Curry 1/2" Polka Dot Grosgrain Ribbon; and Scallop Circle Punch; other supplies: Martha Stewart Butterfly Punch; White Dew Drops; Quickutz Label Die; Hero Arts Rhinestones; EK Circle Punch; Cuttlebug Dots Embossing Folder. This sounds like fun, I may have to check it out! I love your nice clean-lines style. Saw your blog address over at Let's Scrap and thought I'd check it out.